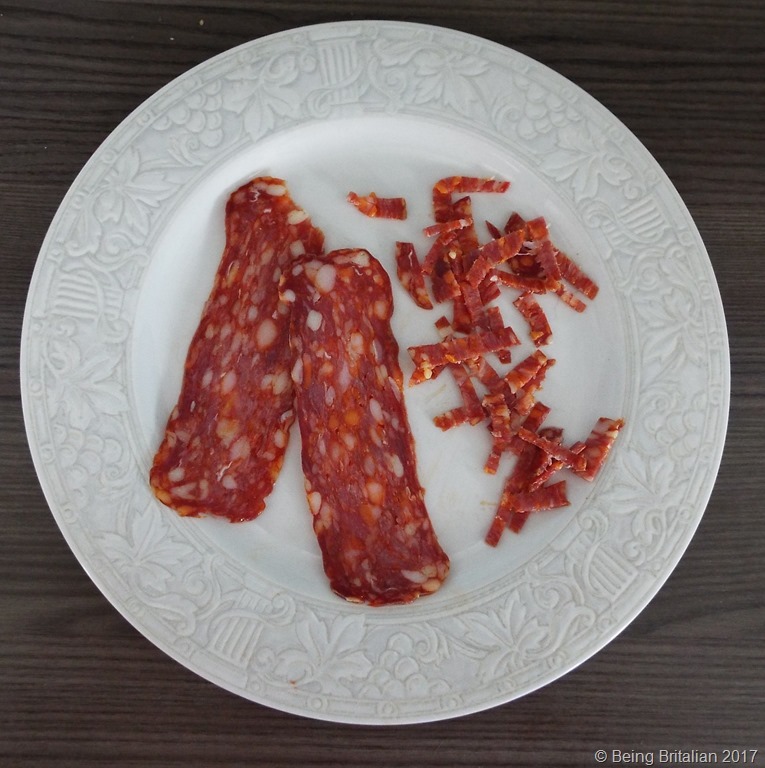 Following on from my previous blog post Gli Abruzzese Non…I visited several butcher shops this week in search of meat that’s not readily available. Readily available meat here includes chicken, pork, rabbit and even horse; but my quest was for petto d’anatra (duck breast) in fact I’d even settle for a whole bird as it’s been such a long time since I’ve eaten any. The first shop keeper told “l’anatra non viene mangiata, solo le uova.” meaning duck isn’t eaten here only the eggs are. The next butcher shook his head and said something similar, so I decided to try my local butcher who has been quite accommodating to my requests previously. “Do you sell duck?” I asked. This was followed by the similar response of the earlier butchers. So I gave up and was just about to leave the shop when I turned back and asked if they could get me some pigeon. To which I replied “The English do.” She exhaled loudly, shook her head incredulously and retired into the back room of the shop, leaving me to exit her shop in silence. 1 red onion. 500g Arborio rice*. 500g asparagus. 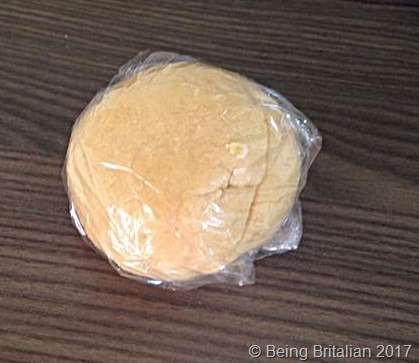 100g soft cheese. 100g cubed pancetta. 400 ml vegetable stock and 2 garlic cloves. You’ll need salt and pepper and a squeeze of lemon to season. A glass of white wine and my special asparagus stock. 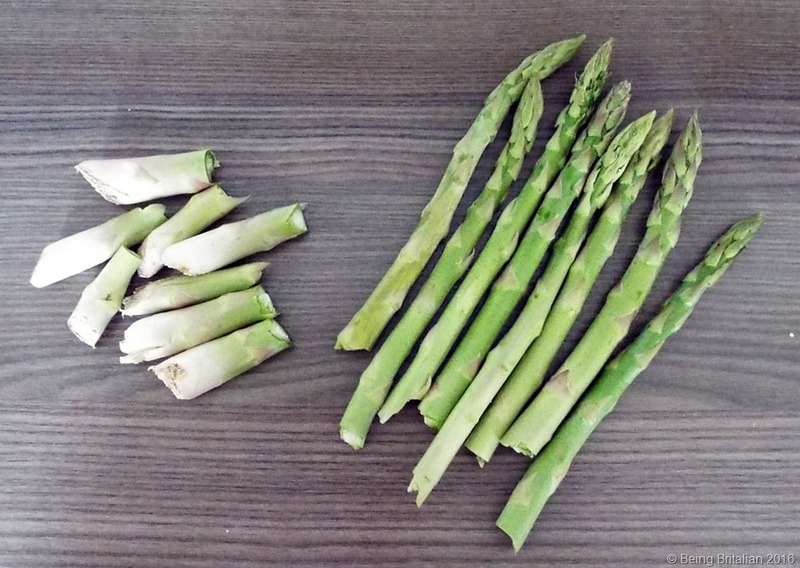 To make my asparagus stock for extra flavour, Snap off the bottom inch or so of the asparagus using your fingers; the stems will naturally break where the tough woody part ends and the tender stem begins, then cut the green tip from the woody stem and add to 600 ml of boiling water. Let the asparagus cook until the water has reduced by half and the stems are so soft they can be crushed between a finger and thumb. Add to a blender and whizz up into a green liquid. Now you’re ready to make the risotto. Chop the onion roughly, no need to create equal sided cubes as years ago I was told by an Italian restaurant owner that risotto should be rustic and comforting. Flash fry the onion and pancetta in a little olive oil (not extra virgin) for 3 or 4 minutes and then put to one side. 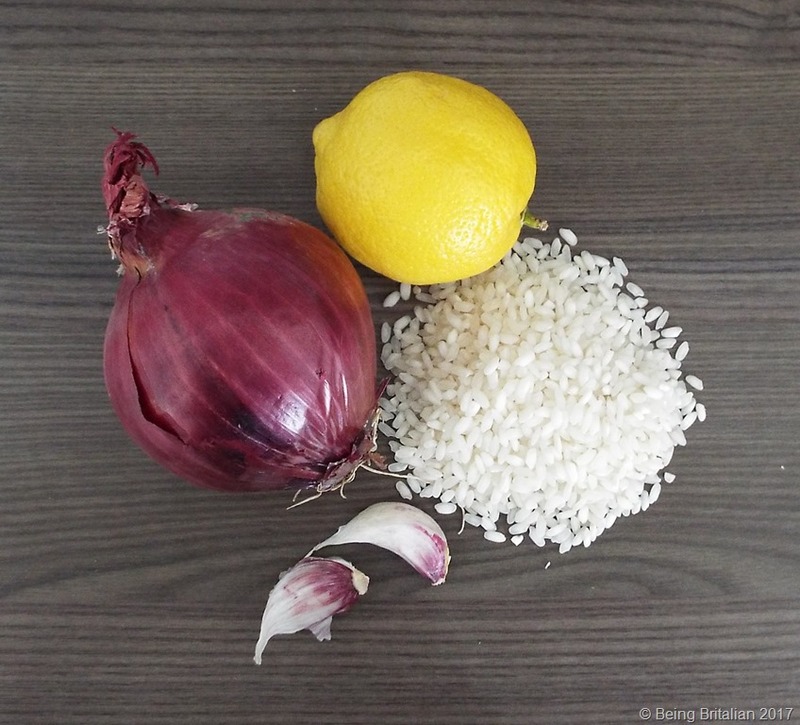 To the pan add some olive oil and when hot add the rice and the 2 whole garlic cloves, stir the rice until it’s got a coating of oil then add the white wine and stir again before removing and discarding the garlic cloves as we just want a hint of its flavour. Add the pancetta and onion followed by the 300 ml of asparagus broth; don’t go in for all of this a ladle full at a time nonsense, just pour it in and keep the rice moving as it starts to cook. When the rice has absorbed the liquid turn the pan on the hob 180 degrees; this stops the rice sticking and burning in one spot of the pan. 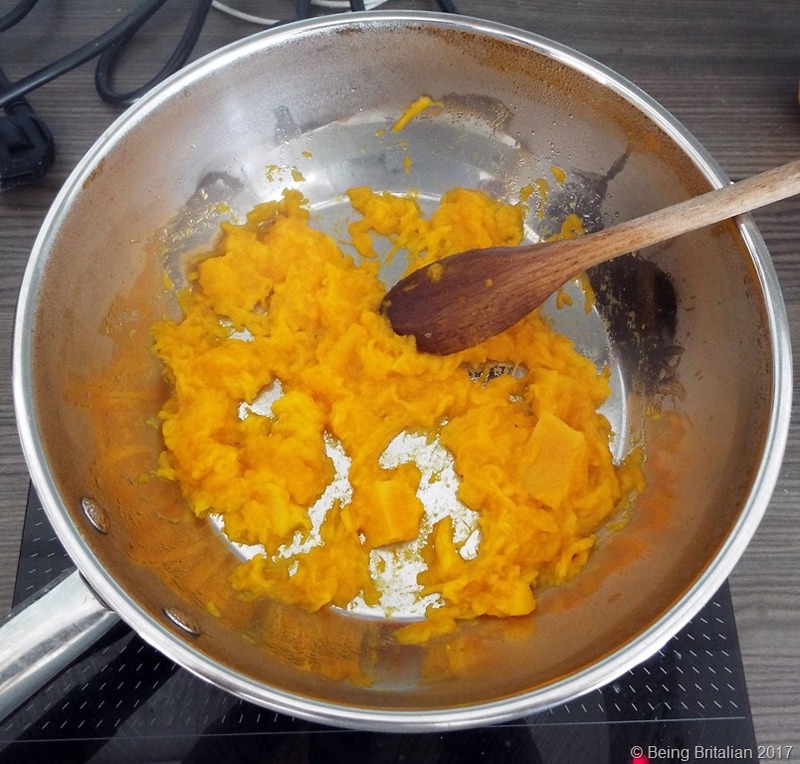 Add half of the vegetable stock and continue stirring, add salt and pepper to season and repeat when the liquid has been once more absorbed. 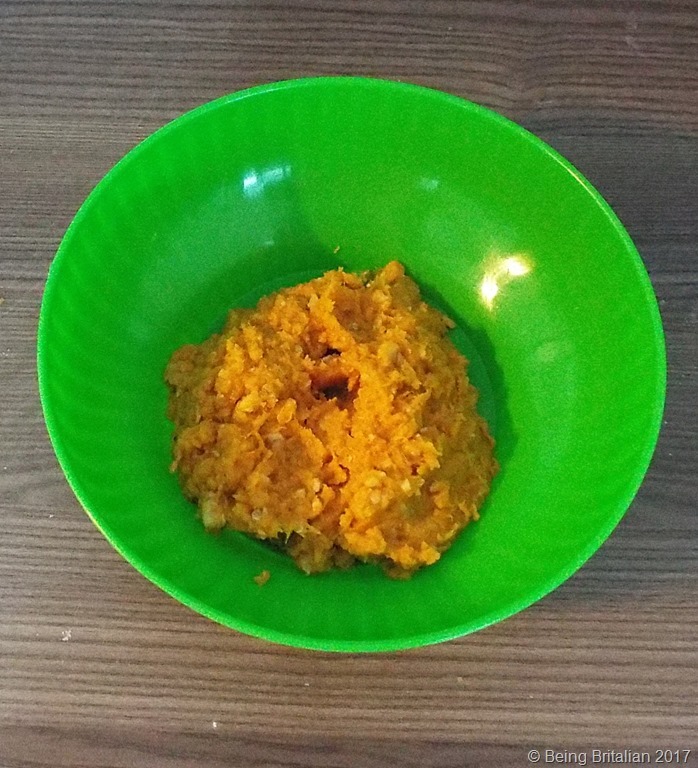 Once the rice is cooked and the liquid absorbed take it off the heat and add the soft cheese and place a lid or a plate over the pan as it melts into the rice. 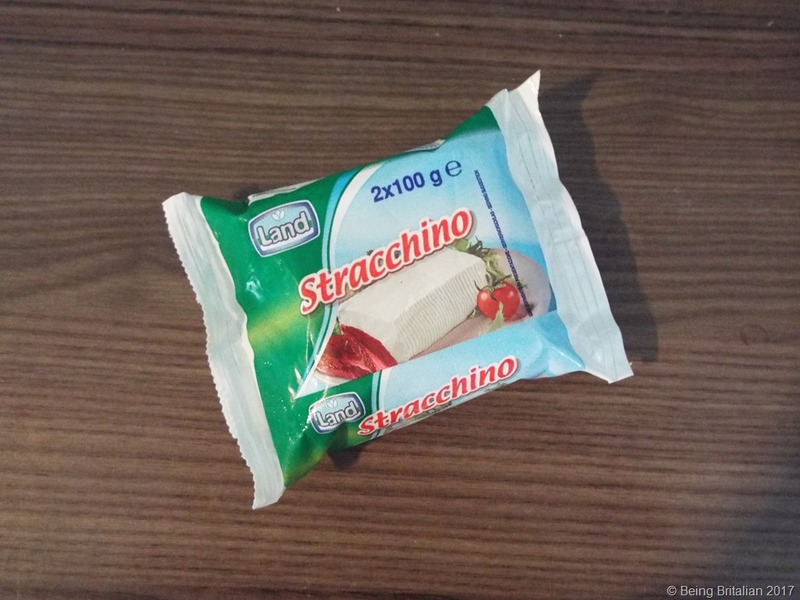 I use stracchino, a young cow’s milk cheese also know as crescenza, if you don’t want to add cheese simply substitute it for 50g of unsalted butter. Once it’s melted I give the pot one final stir and a squeeze of lemon juice and it’s ready to serve up. I had one lonely slice of ham languishing in my fridge so I ripped it up and tossed this into the pot alongside the onion and pancetta rather than waste it. If you have a few left-over mushrooms you could add these if you like, in fact anything can be added to a risotto to save waste. * If you prefer your risotto made with either Roma or Carnaroli rice this is okay, I use Arborio as that’s my personal preference. 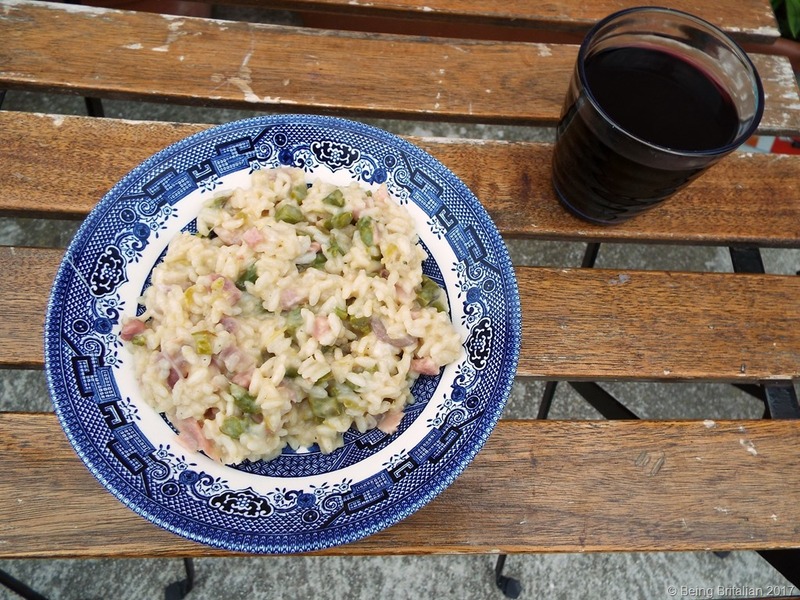 There you have it, una ricetta semplice (a simple recipe) for risotto without all the fussing and faffing of a television chef. As most of Europe is currently under attack from Arctic blasts and ‘thundersnow’ we didn’t escape it here in Abruzzo. The snow is finally thawing following a seven-day period of deep deposits. 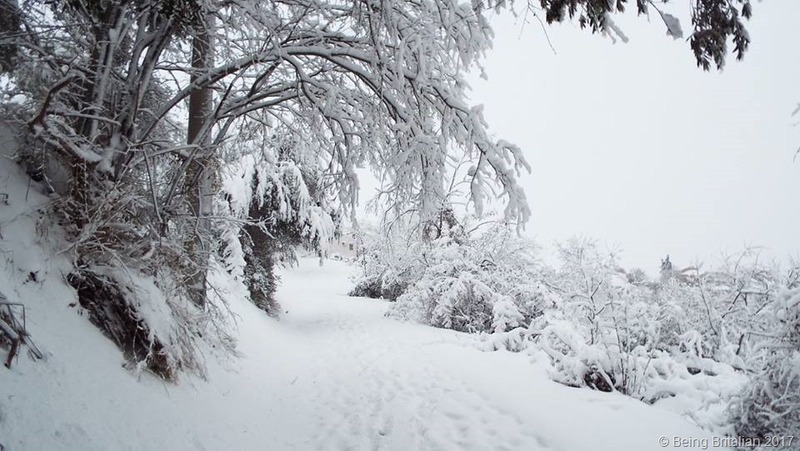 It all looked very pretty, but it was so deep in places that villages were cut off, not to mention water pipes frozen and electricity lines going down. So trapped at home until the lane can be cleared I turned to passing the time getting used to induction cooking. We don’t have mains gas in our lane and have used a gas bottle cooker for the past few years, it was sufficient for our needs until in autumn a field mouse took up residence in the back and chewed through the pipe to the oven. Now I have a nice fan-assisted electric oven I thought it may be a good idea to go all electric to remove the need to buy and store gas bottles. 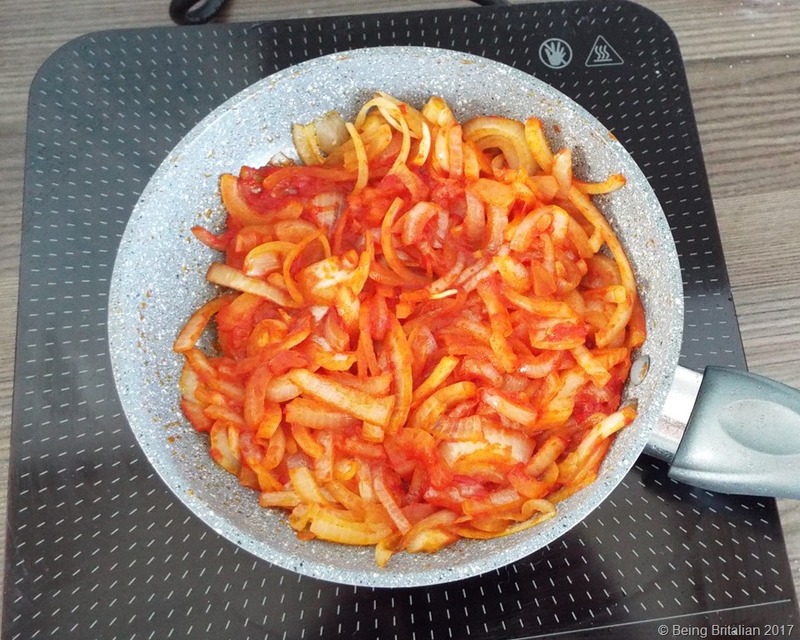 I was helping a friend prepare lunch using her induction hob and was so impressed I went out and got myself one. I then spoke with another friend who had a double hob for sale, and so now I am learning to use them and thus far I’ve been impressed with the speed of cooking and the control of the heat. 400g veal. 2 small onions. 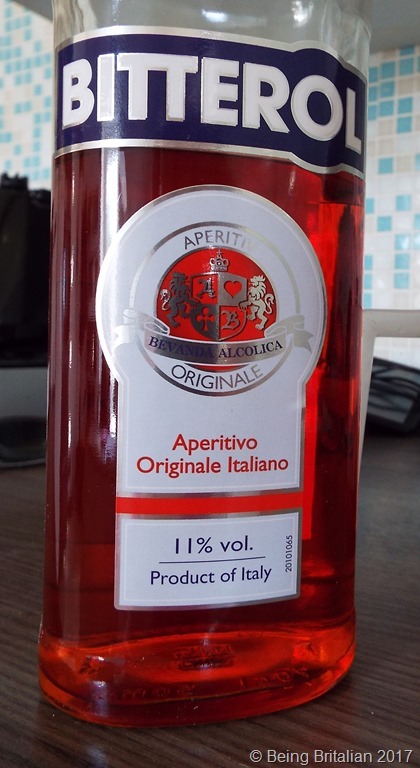 300 ml passata. 160 g mushrooms. 200g carrots. 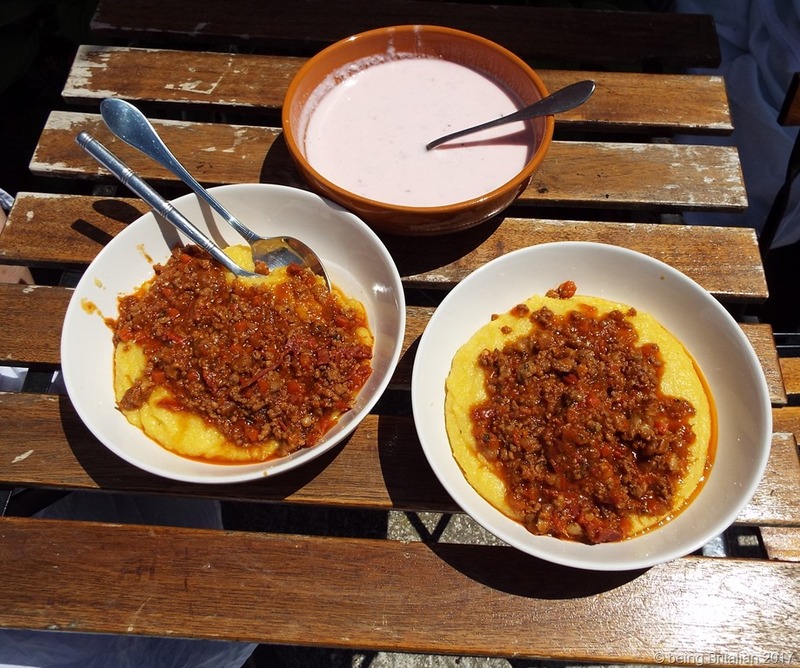 2 tablespoons of tomato puree. 500 ml home made veg base. In the late 1970’s people became outraged to discover the veal they were eating was produced by keeping calves in the dark inside boxes to restrict movement. 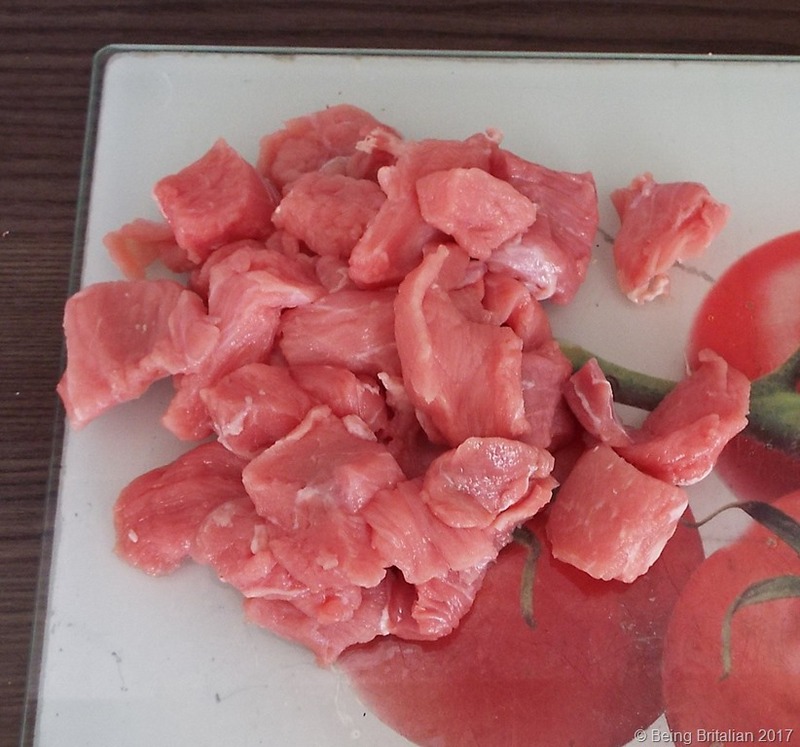 This led to a rapid decline in the UK for veal consumption, even now very few butcher’s shops openly sell it. However here in Italy I purchase what we now call rose veal, its male calves that have been raised until they are 8 months old rather than being culled at birth. It’s not a pale as milk fed veal but tastes very good. 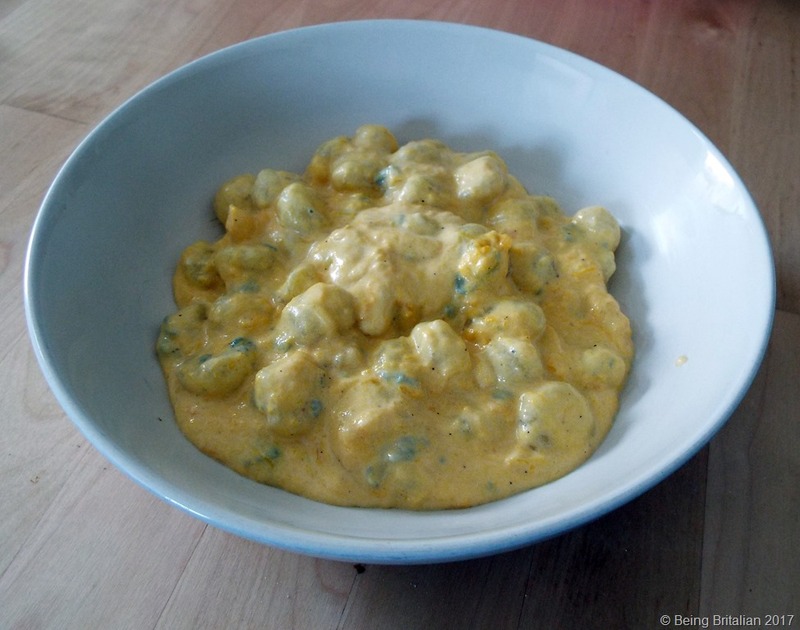 If veal still isn’t your thing substitute it for pork in this recipe. 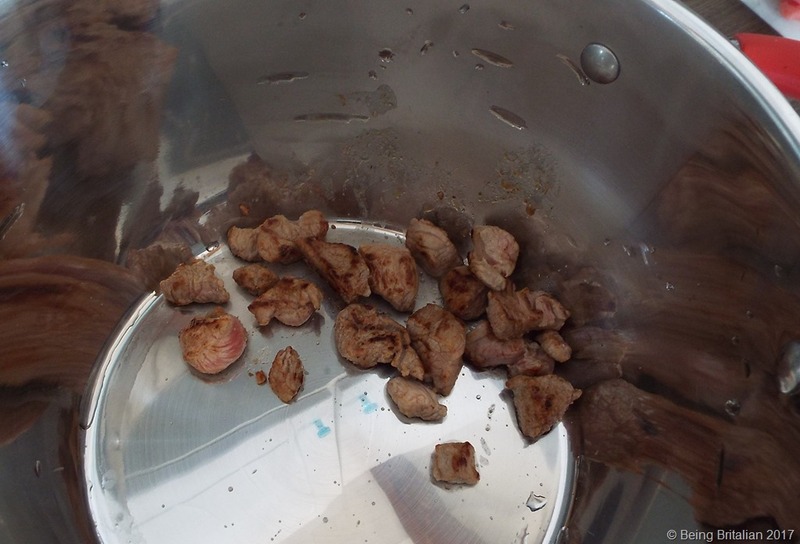 Cut the meat into bite size pieces and brown it off in small quantities and add to the stew pot. Chop the onions and sweat them off in a frying pan for a minute or so, then add the tomato puree and cook it off.This sweetens the onions and helps to pick up the pieces of veal that have caramelised in the pan earlier. 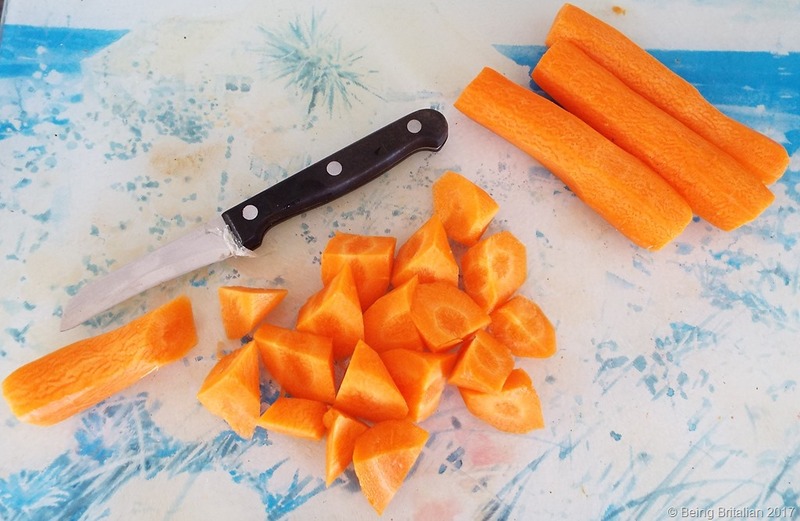 Chop the carrots: I chop alternate sections diagonally as you get an interesting shape that also has a larger surface area so cooks quicker and evenly. Add to the pot a liberal amount of garlic powder, black pepper and a good pinch of chilli flakes. 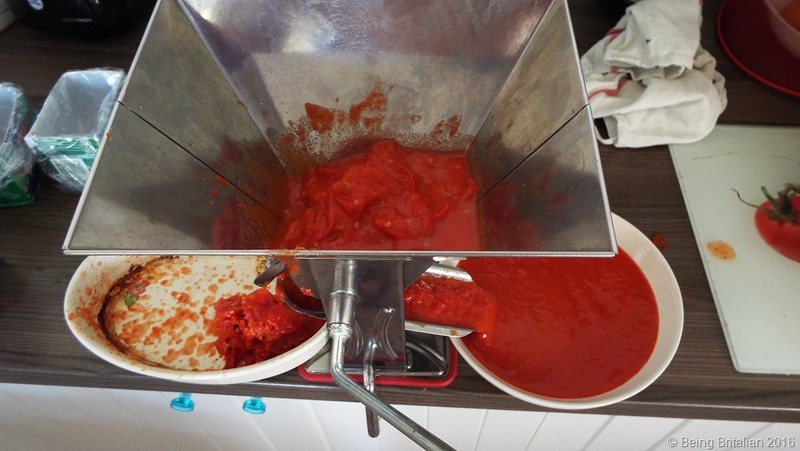 Following this add the passata; shop bought is okay or make your own, it’s so easy. My recipe is here. 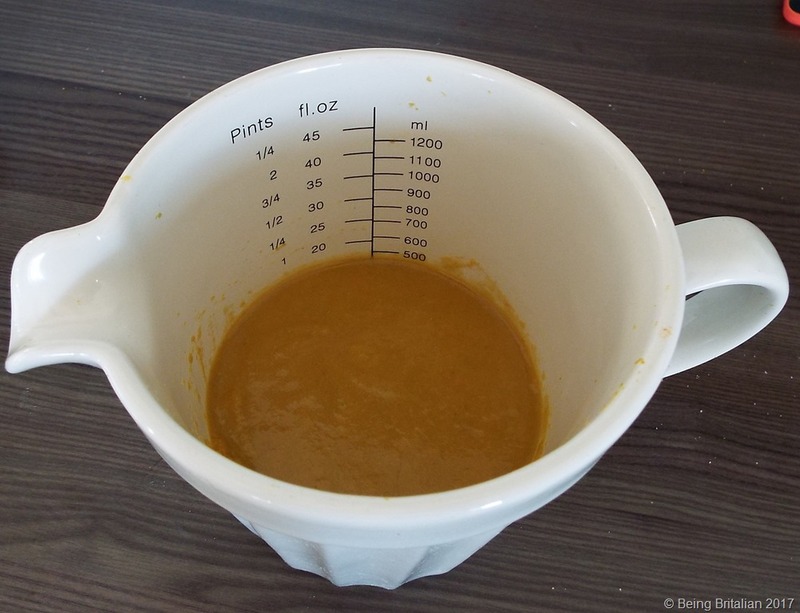 Following this add 500ml of stock or home made veg base. As I hate waste, what I do is add what left over veg I have to a pan of water and boil it all together. 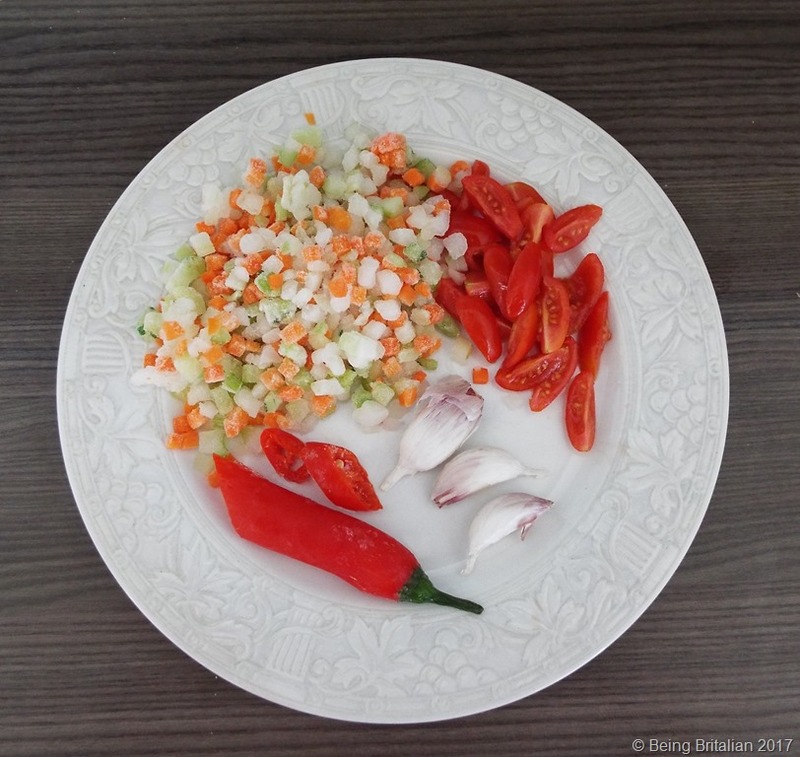 This one was made from a couple of cabbage leaves, a carrot, half an onion and a few celery sticks. 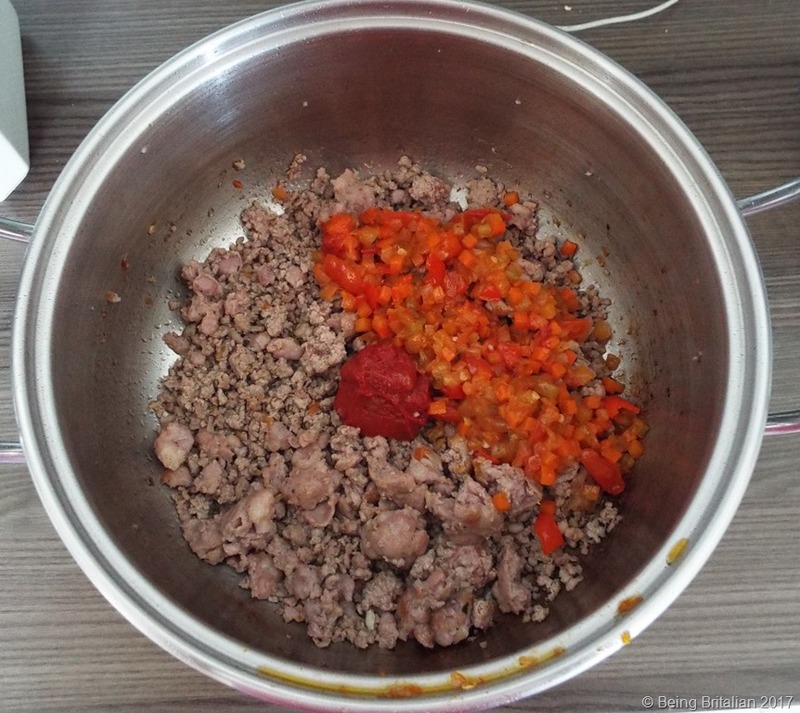 Boil it all together then blend it and bag it and store in the freezer until you’re making a stew or soup. Much better for you than shop bought stock, full of chemicals and salt. Bring the pot to the boil and then turn the heat down and let it simmer until the carrots are softening; this took just 15 minutes on the induction hob. 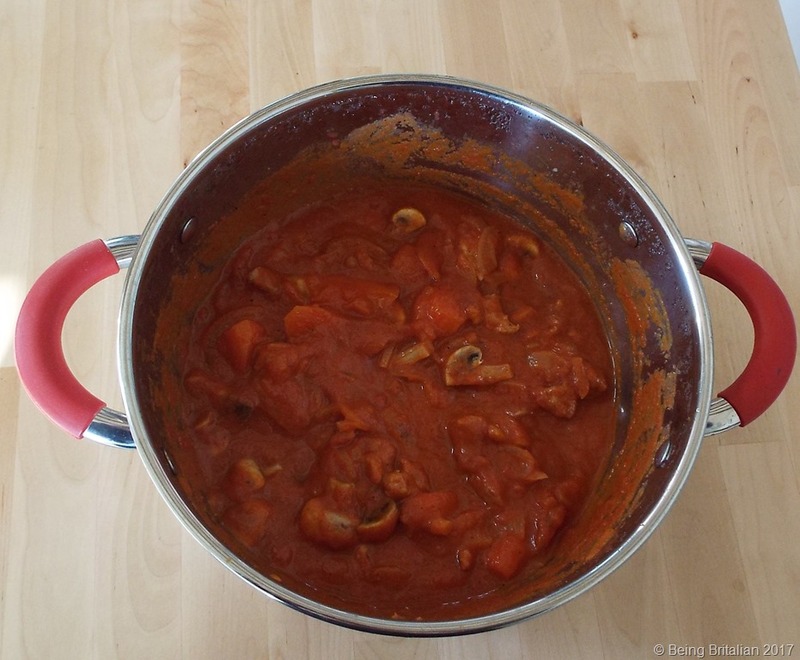 Then add a splash of white wine followed by the mushrooms and continue to simmer until everything is cooked through and the carrots still have a little bite. serve with mashed potato and sit beside the log burner watching the snow fall as you eat this comforting stew. One other thing – this is also amazing if reheated the following day. 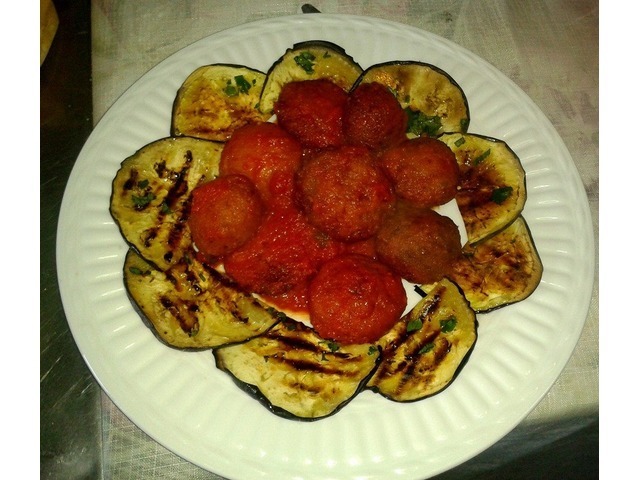 Buona cena a tutti. One of the things that I like most about being in middle Italy* is seasonal eating. 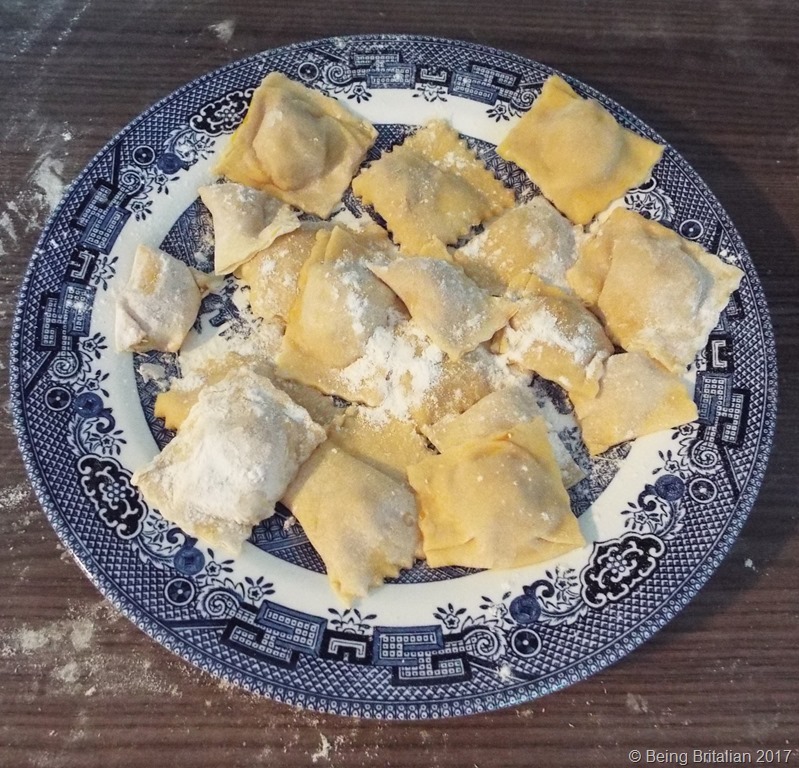 Italy is much better than the UK for eating what is in season rather than importing from far afield: Now this is only an observation based upon my experience here in Abruzzo. Possibly up in the affluent North there’s supermarkets filled with out-of-season produce meaning the discerning Milanese can have asparagus all year round. It’s asparagus that I’m talking about today – Okay I admit it, that was a tenuous link. Asparagus is one of the healthiest vegetables out there, it’s low in calories, just 20 per 100g but it’s also high in potassium, b-complex vitamins and other healthy green stuff and it tastes lovely too. Italian asparagus season starts in March with the local population combing every lane and slice of rough land for the wild variety, which is bitter to the palate and spindly; but good in an omelette with lashings of black pepper and a knob of salted butter. At the moment cultivated asparagus is in abundance; In fact down at our local store it’s just €1.49 a kilo, so it would be silly not to take advantage. So I got some for the freezer and some to just enjoy while it’s fresh. 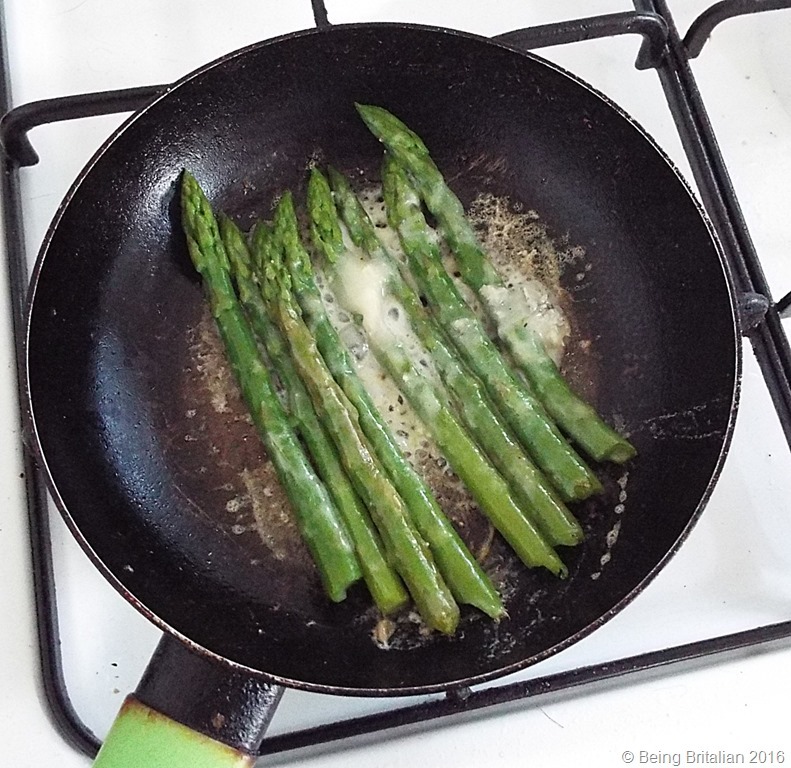 Now there’s a few folks who say asparagus doesn’t freeze well, but I find if you blanch it for no longer than 2 minutes it keeps well frozen and is then best grilled or oven baked rather than steamed once defrosted. 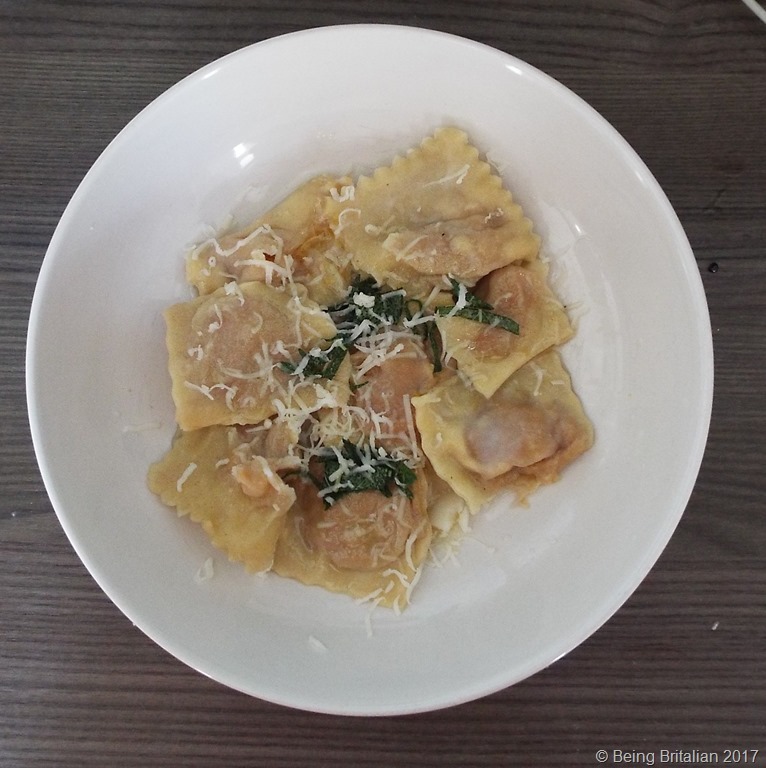 So today I made a super easy Italian lunch with just three ingredients, (six if you count seasoning – but who’s being pedantic?). 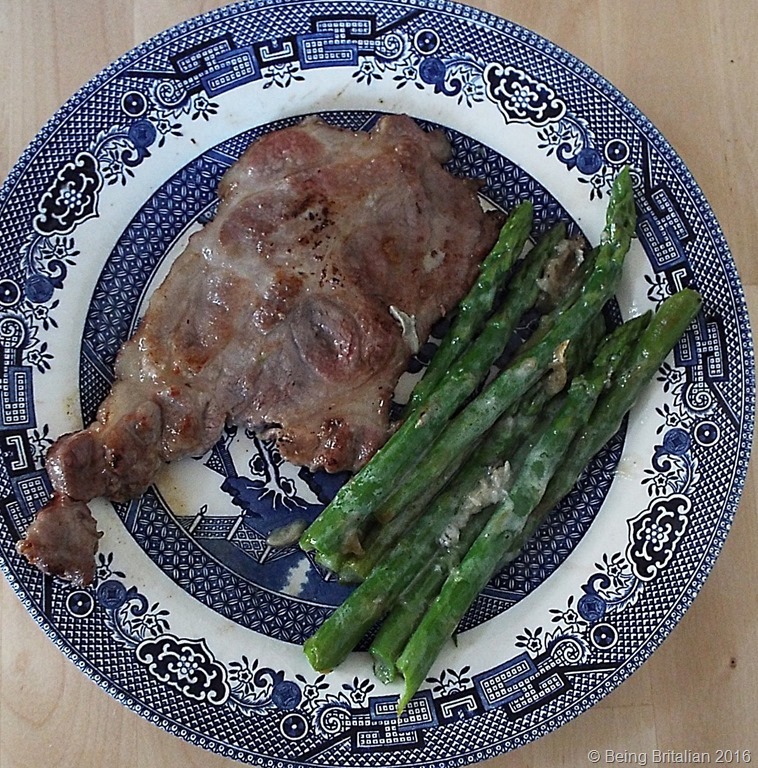 So here it is my easy pork and asparagus lunch. (serves one). See it’s that easy. The only additional things you need are salt, pepper and lemon juice. let’s get started. Trim off the woody ends of the asparagus and set them aside, I’ll tell you why at the end**. 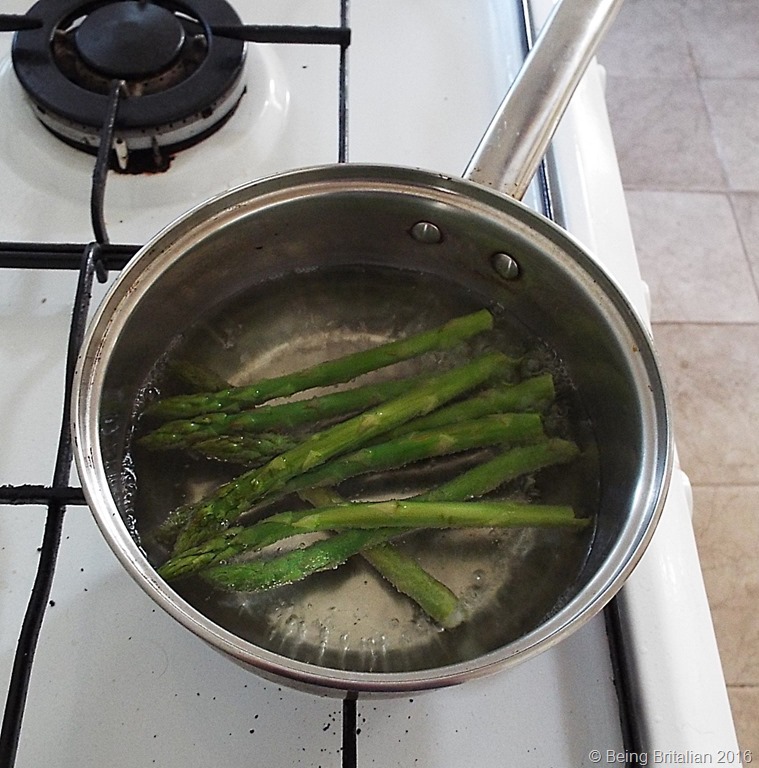 Put a pan of enough water to just cover the asparagus on to boil and add a pinch of salt. Once the water is boiling put in the asparagus and boil for just 4 minutes rinse in cold water to stop the cooking and keep the colour and put them onto one side. 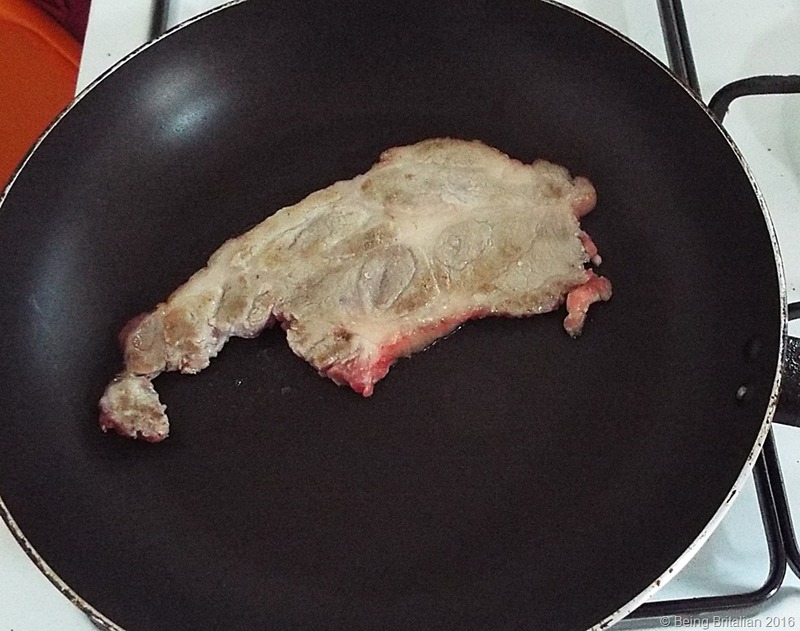 Heat a non-stick frying pan, do not add any oil and once the pan is hot put in the pork steak and cook, turning it over at intervals until, it is cooked through to your liking. (Despite the traditional way of cooking this meat, I prefer my pork to be a little underdone). Once the pork is cooked, set it aside to rest and drop the Gorgonzola into another pan on a low heat. 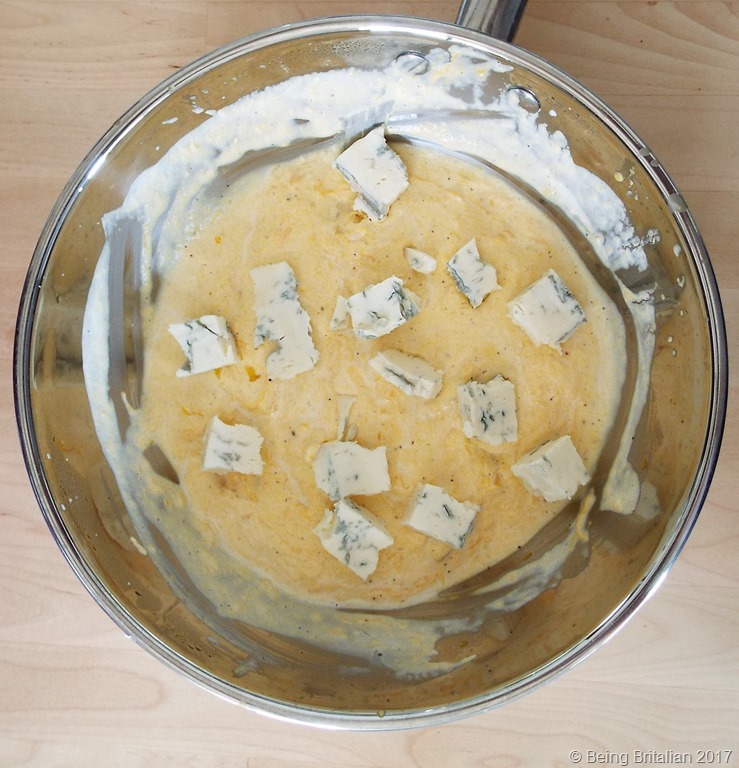 Allow the cheese to start to melt then add the asparagus and cook for 3 minutes giving it a pinch of black pepper. 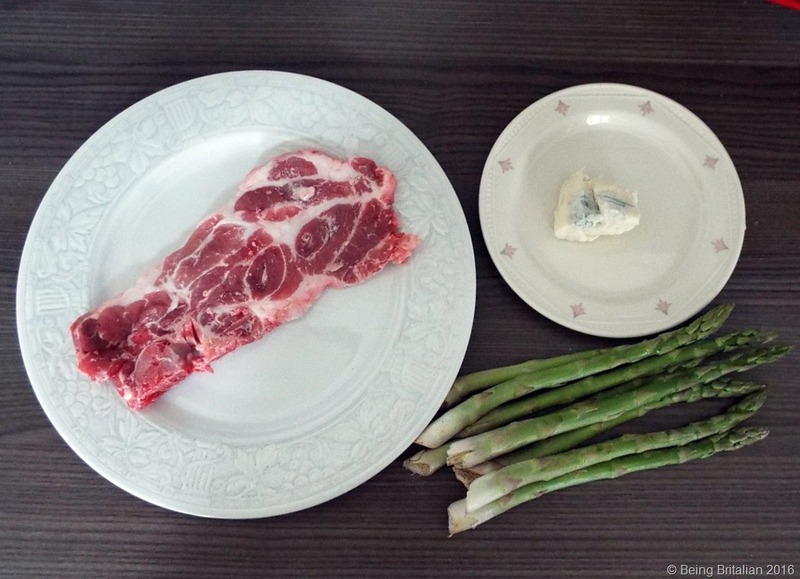 Once the asparagus is coated with the molten blue cheese add to a plate and serve with the pork and give the whole dish a squeeze of lemon, (the juice in a plastic lemon is okay if you don’t have a fresh one to hand). 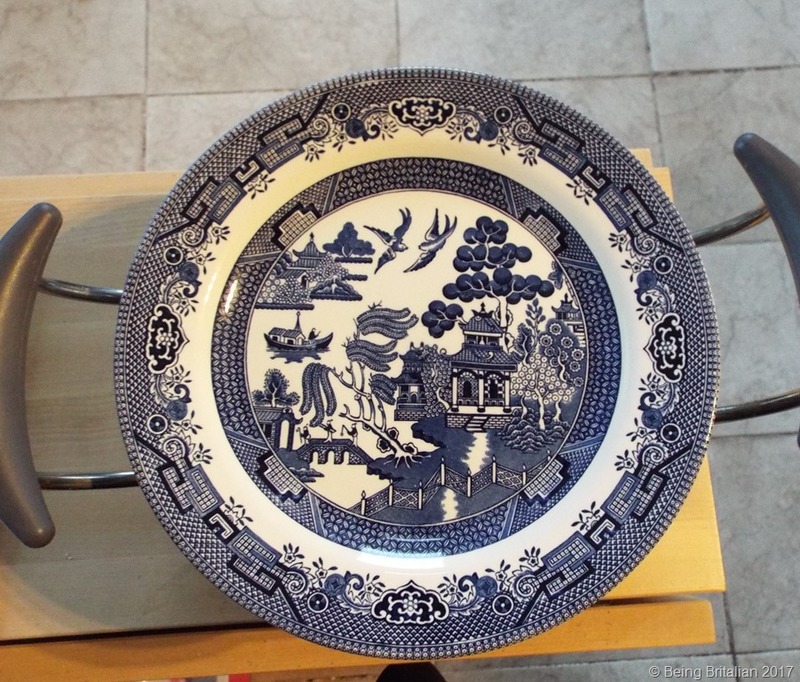 Once plated up sit down in front of it and devour your lunch with relish. * I call Abruzzo middle Italy but people here refer to it as southern Italy saying the north ends at the Marche border. 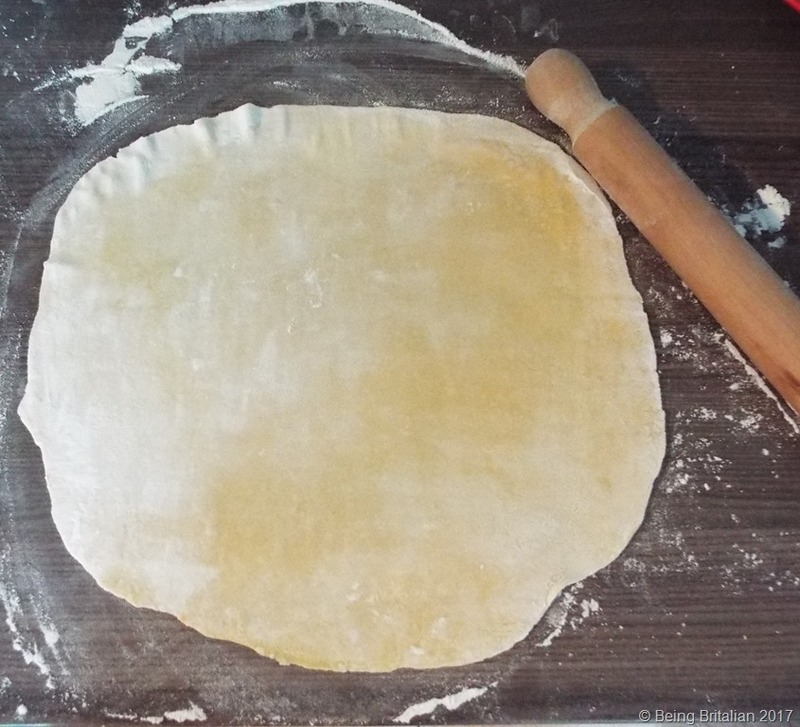 ** Drop the woody ends into boiling unsalted water and let them boil away for about 20 minutes, they’ll be soft at the end of the boiling, but discard them and keep the water. Let it cool and then freeze it until the next time you’re making a risotto with asparagus, drop the frozen asparagus broth into your risotto for an extra hit of flavour. 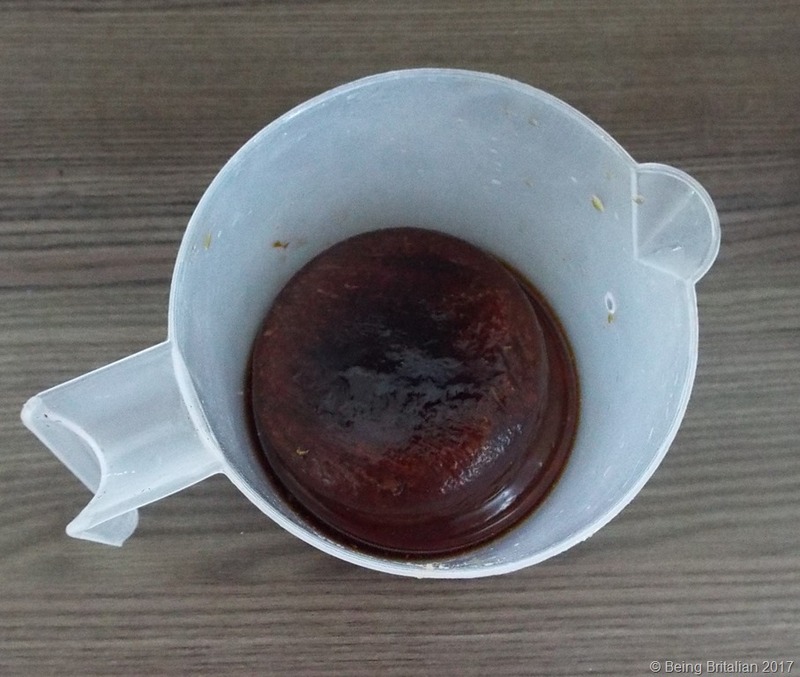 This also works if you’re making a soup use the frozen asparagus broth as you would a shop bought vegetable stock cube.